Hastings Country Park Nature Reserve is the most prestigious area of biodiversity management in the Borough. It is the largest area of public open space in the borough. View a map of Hastings Country Park Local Nature Reserve. The reserve consists of Hastings Cliffs Special Area of Conservation, Hastings Cliffs to Pett Beach Site of Special Scientific Interest and Hastings Country Park, as well as heritage designations such as scheduled ancient monument. The site is renowned as an area of archaeological importance. All the various designations and land uses were brought together under the Local Nature Reserve designation in 2006 to provide a focus for future management. The reserve is a beautiful area of ancient gill woodland, maritime cliff and slope, cliff top grassland and mixed heather, lowland meadow and sustainably managed farmland, all sitting with the High Weald Area of Outstanding Natural Beauty. 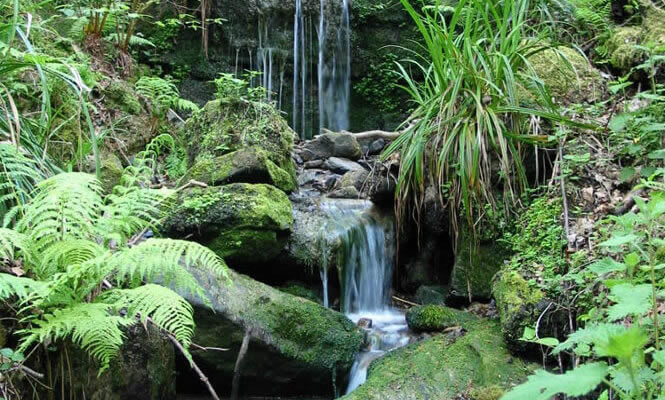 The nature reserve covers 345 hectares (853 acres) of coastal gill woodlands, open pasture and cliff top grassland, together with five kilometres of dramatic soft rock cliffs and coastline. Some of the most stunning views of the south east coast can be experienced from the cliff tops. On clear days there are spectacular views overlooking the coastline from Beachy Head to Dungeness and as far afield as Folkestone and the coast of France. It is difficult to underestimate the importance of the site to wildlife conservation on a national, international and local context. The site is an outstanding area for birdwatching with many species breeding throughout the various habitats. Many rare and scarce liverworts, mosses and lichens occur within the gills. Peregrines, black redstarts and fulmars breed on the cliffs. Dartford warblers, stonechats and yellowhammers breed on the gorse covered hillsides. Many migrants pass through the site in spring and autumn and usually include a few rarities such as Sardinian warbler, red-rumped swallow, and Pallas's warbler which have all occurred in recent years. A large population of dormice occur within the woodland areas here. Stoats and weasels are also seen regularly and bottlenose dolphin and harbour porpoise can be seen occasionally offshore from clifftop watch points. An amazing diversity of invertebrates live on the cliff habitats and within the heathland and acid grassland including some species which occur in very few other places in Britain. Some notable examples are include the hedgehog weevil, Cathormiocerus myrmecophilus, the ant mimic ground spider, Micaria albovittata, and the nomad bee, Nomada sexfasciata. The cliffs are rich in fossils and have yielded many specimens of dinosaur, pterosaurs, turtles crocodiles and plesiosaurs. The site is one of only a handful in the world to have produced early mammal fossils. Hastings Country Park Nature Reserve, owned and managed by Hastings Borough Council, is one of the foremost coastal nature reserves in the UK. It encompasses a Country Park, a Site of Special Scientific Interest (SSSI) and a Special Area of Conservation (SAC). The 345 ha reserve is situated on the south-east coast of the UK and boasts spectacular scenery, eroding maritime cliff and slope, coastal grassland and heather, ancient woodlands and a sustainably managed farm, all within the High Weald Area of Outstanding Natural Beauty. Until 2000, The Country Park had no management plan. An adjacent commercial dairy farm was polluting the SSSI, species and habitats of UK importance were in decline, and there was no investment and little recognition of the area as an asset to the town. Bracken, gorse and scrub had become endemic, threatening (and in many areas obliterating) coastal acid grassland and heathland habitats. It was clear this could not continue. The council, with Natural England as a key partner, set out to develop a long-term strategy and rescue package. We terminated the farm tenancy and set out a vision to integrate the farm, Country Park and adjacent SSSI and SAC as one integrated, sustainable management unit, prioritising biodiversity and public enjoyment. Essential to this was the establishment of an annual council revenue budget and an elected member steering group to oversee the restoration project. Dilapidated farm buildings were renovated, and in 2004 a 10-year Countryside Stewardship legal agreement was awarded. Our Countryside Stewardship Agreement provided the structure to manage the farmland and Country Park more sustainably; to prioritise management for farmland birds, introduce conservation grazing, protect and restore important habitats, and allow wildlife to thrive. 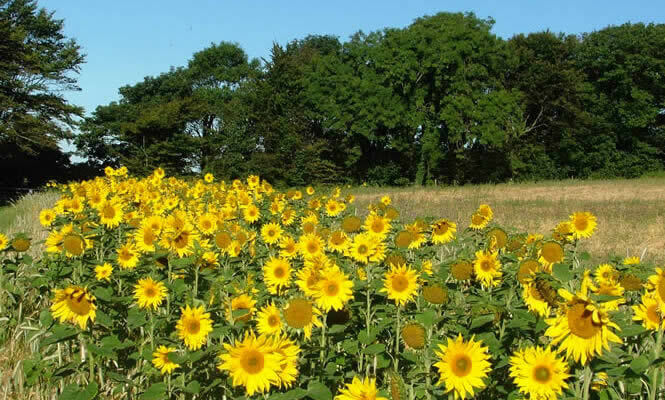 In 2006, we combined the farmland, Country Park, SSSI and SAC under one designation: a Local Nature Reserve. This allowed us to create the town's largest area of sustainably managed natural green space, and manage the entire site as an integrated landscape. 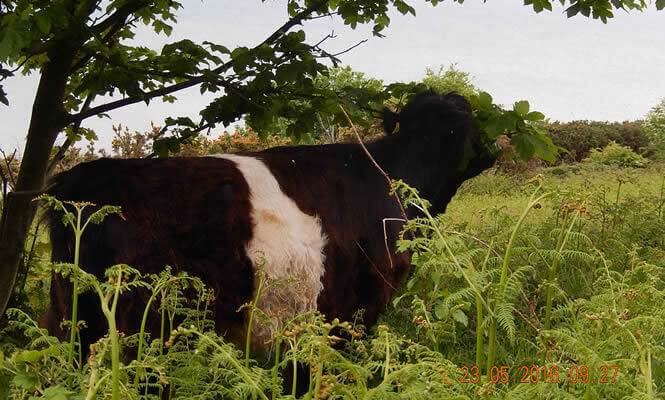 We extended conservation grazing into the SSSI and SAC and employed cut-and-collect techniques on accessible areas of bracken and gorse. In some places we mechanically scraped the deep gorse and bracken litter layers back to the sandstone, to help regenerate a nascent seedbank. We also contract heavy horses to roll and bruise areas of bracken annually. Heavy horses are a great way of deploying traditional methods of bracken control that not only works but is a great attraction for the public. In 2013, Natural England moved the council to a new 10-year Higher Level Stewardship (HLS) Agreement, one year earlier than anticipated. The HLS agreement sets the bar even higher for managing and restoring habitats, and this is reflected in our new management plan. 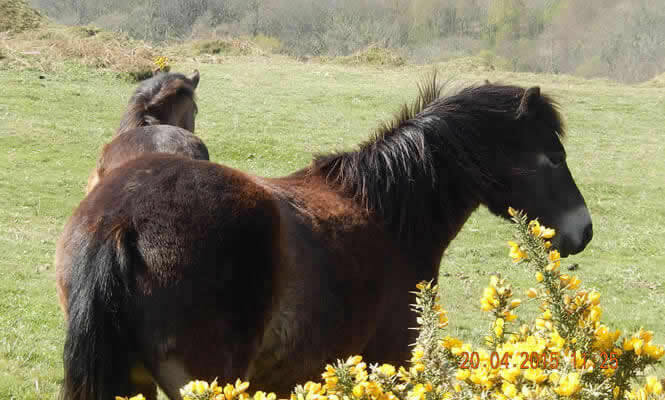 We currently have a small herd of Exmoor ponies and a new herd of Belted Galloway cattle to manage glens and slopes in the SSSI and SAC, which are otherwise inaccessible to mechanical management. We have opened up fencing so the cattle and ponies can roam freely around one of our largest and wildest glens, allowing them the same freedom as walkers. Visitors have enjoyed connecting with these charismatic animals, and they have been extremely successful in managing the reserve sustainably. Large areas were awash with bluebells in spring, and now with red campion, bedstraw, sheep's sorrel and foxgloves. The open areas are also alive with invertebrates. The management of the reserve has been a journey in innovation and risk-taking, being clear on our biodiversity objectives, communicating our message, having the support of councillors, and taking people with us. We have successfully combined biodiversity and wildlife with accessible natural green space for the benefit of the local community - with Hastings Country Park Local Nature Reserve winning Green Flag status every year since 2006. However, we recognise there is no end to management and habitat restoration, and our continuing challenge is how to retain success and commitment with ever-reducing resources. Our landscape and habitat management is an example of realising a vision over a very long term. Changing landscapes and restoring habitats takes decades. It is not unrealistic to think that the management we have and are putting in place is the bedrock for realising a vision of landscape and habitat management over the next 100 years. None of this would have been possible without the dedication of our rangers, conservation volunteers, the Friends of Hastings Country Park, the support of elected members and the commitment of our local Natural England office. A section of Ecclesbourne Glen at the East Hill is subject to ongoing landslips. As a result, footpath closures are in place and there is no access to Ecclesbourne Glen from the East Hill. The landslip has made the footpaths too dangerous for people to access. We have closed the footpaths for your safety. Please do not try and cross the barriers. Access to the rest of Hastings Country Park Nature Reserve has not been affected. The footpaths affected are Definite Public Rights of Way Nos. 379a, 364a and 417. A Temporary Footpath Closure Order is in force for 18 months from 15th November 2016. After this period, any further extensions will require approval from the Secretary of State, should the footpaths still be unfit to use. For information relating to the Right of Way and footpath closure, please contact East Sussex County Council Rights of Way Access Team on 0345 6080193 or email rightsofway@eastsussex.gov.uk. For all other information please contact Hastings Borough Council on 01424 451066 or email complaintsandcomments@hastings.gov.uk.